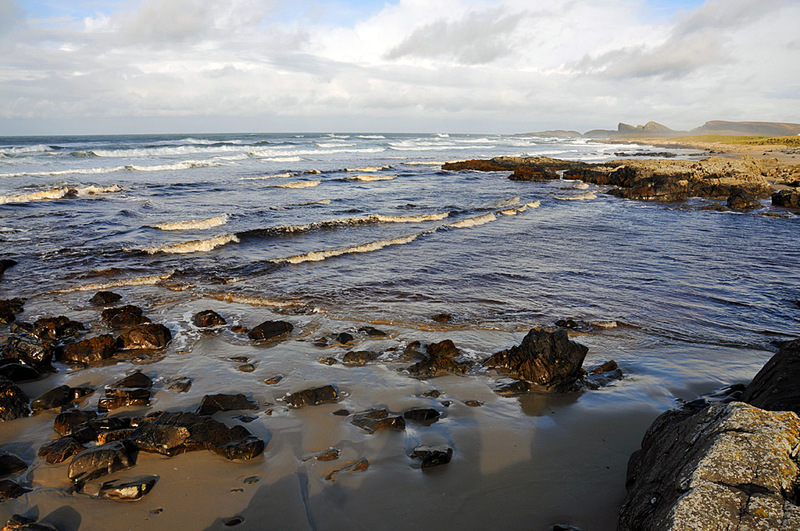 A bit of an uneven contest on the west coast of Islay: From the right Saligo River is running into the sea, from the left the Atlantic is pushing in its waves at high tide. Also the ‘Opera House Rocks’ in the distance on the right. This entry was posted in Beaches, Cloudy Weather, Landscape, Repost, Sunny Weather and tagged Islay, Opera House Rocks / Sleeping Giant, Rhinns of Islay, Saligo, Saligo Bay, Saligo River by Armin Grewe. Bookmark the permalink. What a special light that the waves in the front have a white cap and those in the distance more orangy. Nice to look at during my work day!